It's Monday, What Are You Reading? is now hosted by Kathryn at The Book Date. It’s Monday! 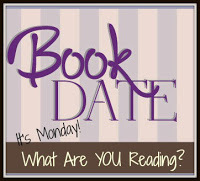 What Are You Reading is where we gather to share what we have read this past week and what we plan to read this week. It is a great way to network with other bloggers, see some wonderful blogs, and put new titles on your reading list. I will be combining my YA and adult reading and purchases on this one weekly roundup. YA and middle grade reviews will still be posted on Ms. Martin Teaches Media - my other blog. Last week was a pretty quiet week. My new television did arrive and was installed on Friday. I also had them make sure that everything was attached and working including my new Amazon Fire. Friday night was the first night that I could watch my MLB.TV Atlanta Braves game on the big screen. They lost but the picture was marvelous. We're still waiting for our new garage to be built but the electrician did come over on Friday to find out what we wanted in terms of electricity. Now we are going to have to shop for new light fixtures since we also want to replace the outside lights on our house so that the ones on the house and the garage match. As far as I know, everything is proceeding as it should for our house sales. I heard that my townhouse had its appraisal on Friday but I haven't heard the results. My realtor is also working on the one item on the inspection report that needed to be fixed which should happen sometime this week. We seem to be in a cone of silence regarding the Locust Street house. Our papers list three different potential closing dates and our realtor doesn't know which one, if any of them, is the correct date. I think we're still waiting for the appraisal on that house. Meanwhile, summer is rushing by with lots of great weather mixed with rain and thunderstorms. We're 4 inches above average rainfall for the year which makes us nice and green but also is the main reason we don't have a new garage yet. I finished my Liaden Universe re-reads and went back to my September release review books. I started by abandoned The Equals by Daniel Sweren-Becker. I didn't enjoy the style of the writing which was more tell than show and just seemed clunky to me. When The Equals didn't work for me, I chose Refuge for Masterminds by Kathleen Baldwin from my TBR mountain to fill the slot on my calendar. This is alternate history with a paranormal twist. I want to re-read Anne Bishop's Others series but am determined to read review books that are releasing in September first. Want to See What I Added to My Stack Last Week? Body on Baker Street caught my eye. You are doing a lot of juggling with real estate, but it sounds like everything is falling into place. I love getting a new TV. Enjoy! Body on Baker Street looks interesting...and I downloaded Come Sundown this week. Thanks for sharing, and for visiting my blog. Glad your tv is working , sorry your team lost. Have a great week! Seems like you're an efficient planner- I know moving houses can be hard. Hope all the home sales come together quickly for you both so you can concentrate on what you want to do at the new house. Summer sure is rushing by! Have a great reading week. The whole buying/selling/moving a house thing is such a trial! Hang in there! OOh nice ones! Seeing some familiar titles up in your queue! I really enjoyed A Poison Dark and Drowning! Hope you will too! Sounds like you have a lot going on especially with your properties. Hope you enjoy your reading. Hope you like Refuge for Masterminds, I've been enjoying that series. Nyxia looks interesting. Lots of good looking books here. Come see what I'm reading. YAY for a new TV; going through all of that real estate stuff is quite overwhelming, so I hope it all goes well for you and that you get some relief soon! Lots of exciting reads to keep you busy, too! Enjoy your new big TV. And all the books on your list. Whew! I haven't read a Nora Roberts book in quite awhile. I just recently picked up her book, The Obsession. It sounds intriguing. Happy reading!